We’re at Google I/O this week, so if you’re at Moscone Center in San Francisco, look for the people in the trendy black T-shirts. In this week’s newsletter, we have some news about Evernote Devcup and the updated SDK agreement. Plus, we want to hear your thoughts about how we could improve the Developer Portal. As always, if you have any questions, or want to share an item for the newsletter, you can get in touch by posting on our general discussion forum. In case you missed our letter last week, here’s a quick recap. The next phase of our beta program in early June will include a huge number of new features, backend re-architecting, and front end build-out. This will be the first time the three major components of our product – Airspace, Leap Legacy, and Leap Core Services – will come together before a large group of people. Read more. As a member of the beta program, you’ll be among the first to really try out the final Leap Motion experience, including access to OS-level control. We’ll be taking rolling submissions to Airspace in the lead up to launch. Designers and developers at the Evernote Devcup will be able to use the Leap Motion API to create new ways of exploring and interacting with notes. You can be among them. By submitting an app that uses both the Evernote and Leap Motion SDKs, you have the chance to win one of many prizes, including a trip to Silicon Valley to pitch on stage at the Evernote Devcup. The next big hackathon for this ongoing challenge is Evernote/Honda’s Design & Build Weekend from May 31 to June 2. Read more. Over the next few days, we’ll be asking developers to accept the new terms in our updated SDK agreement. You can read the full text or check out our FAQ post, which highlights the most important changes. We’ve updated our guidelines for apps submitted to Airspace, with new sections for User Experience (2.3) and Leap Motion Logo Usage (3.7). These new guidelines should assist in providing users with a high-quality experience and ensuring consistency in how our logo is used. Read the latest guidelines. Last October, we established the Developer Portal as an open, friendly space where developers could connect, collaborate, and share. But online communities don’t spring up overnight – they take time and effort to grow and prosper. With every conversation, shared code, and collaborative project, you’ve contributed to that community. With the Developer Portal soon opening to more developers, we thought now would be a great time to talk about what improvements you would like to see. What’s the next step for the developer community? What tools would make it easier for you to connect with other developers? We’ll be looking for the best ways to allow you to provide your feedback. In the meantime, we hope you’ll share your thoughts with us on our forum thread. logotype posted LeapMotionTS, a TypeScript framework for the Leap Motion Controller that includes sample files. To see the latest UI elements and sample code shared by the community, go to the example tag on Links & Libraries. You can share your code on the Projects & Collaborations forum. Control your virtual world with a wave of your hand. 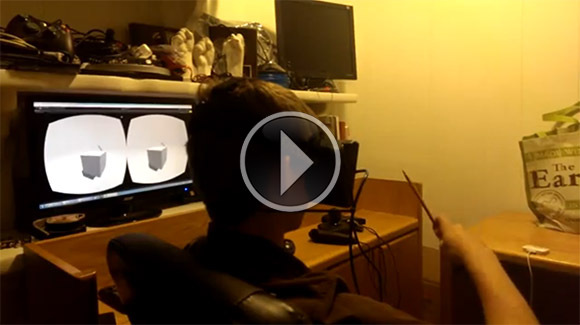 John Selstad posted a series of videos outlining his experiments with a Leap Motion Controller mounted onto an Oculus Rift. Watch the full series for swords and ragdoll physics. Over the past week, we saw some great discussion around distinguishing between left and right hands, including John Selstad’s solution: comparing the position of the finger base to the central palm vector. We’re curious – does your app distinguish between left and right hands? What techniques do you use to accomplish this? Post your thoughts on the thread. This week, we’re heading to Google I/O to showcase the latest developments in Leap Motion technology with more than 5,500 developers and influencers from around the world. Check out our blog post for more details. Attendees will have the chance to #LeapInto Google Earth and navigate the globe with the Leap Motion Controller. Check out HTML5 web applications built for Leap Motion, and learn more about developing for the web with the Leap Motion Controller. A group of Brazilian developers who work with Google technologies and platforms is holding a meetup in parallel to Google I/O. The event will include a demonstration of recent work with the Leap Motion Controller and Google’s Dart programming language. The Ideashaker, TVO’s Innovation Lab, will be walking through its development of their HTML5 game – Caterpillar Count for Leap Motion, a children’s game that has been adapted for gesture control.